Svalbard is an exotic and manifold destination that attracts both Norwegian and foreign visitors. In Longyearbyen there are a number of tour operators, activity providers and places to eat, drink or stay that have been established in order to contribute to the good experiences of Svalbard . Before 1990, an organised travel business was as good as non-existent. The authorities were rather restrictive with respect to the development of tourism in Svalbard . The attitudes changed when it became clear that the travel business could contribute in creating new workplaces and to the stability of the community in Longyearbyen. In the last 10-15 years the travel business in Svalbard has grown both in size and in geographical spread. 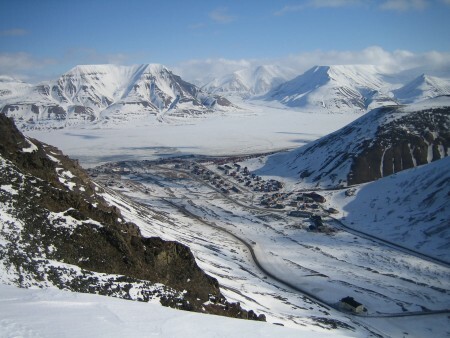 Around 30,000 tourists visit Longyearbyen during the course of a year. In addition the overseas cruise tourism accounts for about the same number, crews included. Svalbard has become a destination with a varied and well-organised tourism. Despite the visible growth, Svalbard tourism is in fact low level. Traffic to Longyearbyen represents, for example, less than 1% of the total tourism business of Nordkalotten. However, increased tourism can lead to environmental problems. Wear and tear on vegetation and cultural heritage monuments and sites, noise and pollution are some of the dangers. The authorities have a stated aim of maintaining Svalbard as one of the worlds best preserved wilderness areas. Is this a realistic aim? Can the modern tourist industry focus on both profit and environmental-friendliness? Local travel business does not see this as an unattainable goal. It can, they believe, be achieved by good organisation, aiming for targets and maintaining close dialogue with the environmental protection authorities. The question arises if this is sufficient – so that Svalbard in the future still will be regarded as the last wilderness?